Gold has been supported due to Fed’s rate hikes issue and it will be under the influence of U.S. Non-Farm Payrolls report. 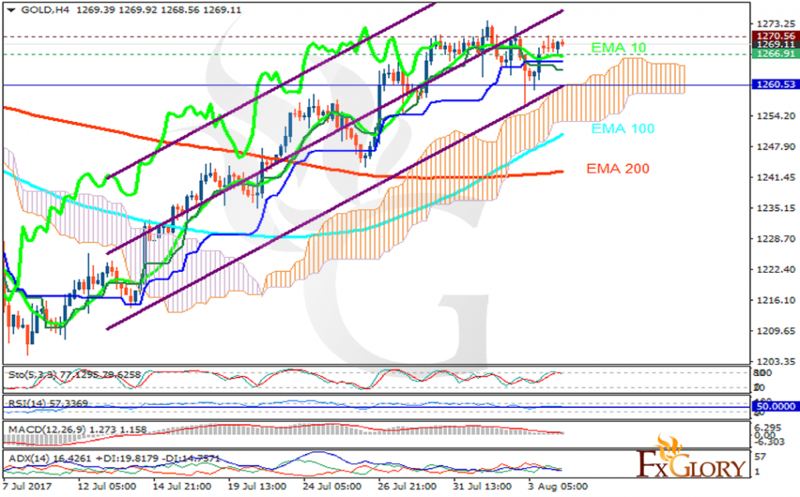 The support rests at 1266.91 with resistance at 1270.56 which both lines are above the weekly pivot point at 1260.53. The EMA of 10 is moving with bullish bias along the ascendant channel and it is above the EMA of 200 and the EMA of 100. The RSI is moving horizontally above the 50 level, the Stochastic is moving in high ranges and the MACD indicator is in positive territory. The ADX is not showing any clear signals. The price is above the Ichimoku Cloud and the Chinkou Span. The Tenkan-sen and the Kijun-sen are both showing a horizontal trend. Gold will continue its bullish trend towards 1275.